Daniel and I have been regular participants of Tymon parkrun for the last four years. We started back in 2015 when I approached the core team and asked if I could run there. They were very accommodating to us. From this day on our lives changed for the better. Daniel was born with a rare genetic disorder called Sotos syndrome which causes severe intellectual disability plus numerous other issues. This meant that Daniel would never be able to talk and have low mobility so he wouldn’t be like other boys. He wouldn’t be able to run around like others. The one thing that became apparent to us is that Daniel loved being outdoors. The early years were very tough coming to terms with it all. I was finding it very hard to cope. I started to run to help with all the stress and anxiety I was suffering with and found parkrun. I loved the great sense of community and was a great way to meet people. Through all the hospital appointments and therapies I was desperately trying to find something positive I could do with Daniel. I had to get a larger buggy which I had to get in from England; it was a jogger type one. I was out with Daniel one day and I decided to try run with it to see if he liked it. Daniel absolutely loved it. This is where our journey began. In February 2015 I signed Daniel up for a barcode for our local parkrun in Tymon Park. I was crying when I did this, seeing his name on the barcode. 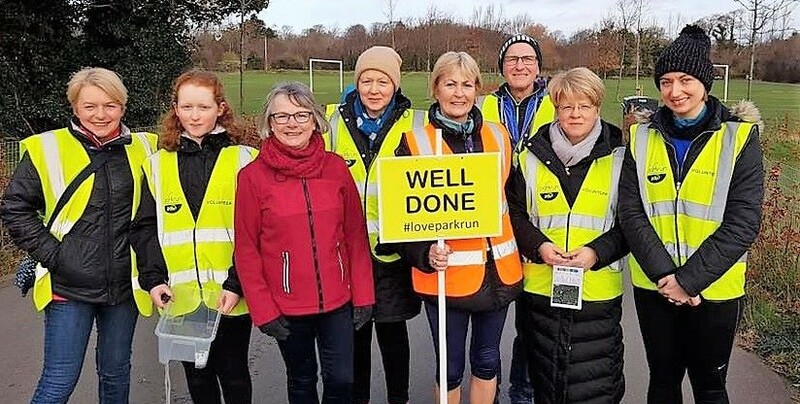 I contacted the Tymon parkrun team to let them know that we would be coming down and the first run we called “Share the love”, it was Valentine’s weekend and Daniel gave everyone love hearts after the run. This was the first time I introduced Daniel to our community. It was wonderful everyone came over to say hello to him and when we were running everyone shouting to him, “go Dan”. The best bit though was the scanning of his barcode and his name up on the results. It was like having his name up in lights. We are now regular parkrunners at Tymon and Daniel is always trying to get his personal best, it’s just great. Over the last four years we have had amazing support and we have held celebrated his birthday here for the past few years. We struggle to have his party anywhere due to all his difficulties, but at Tymon parkrun they make a cake for him and everyone sings happy birthday to him, he loves it. All my family come out and run with him. 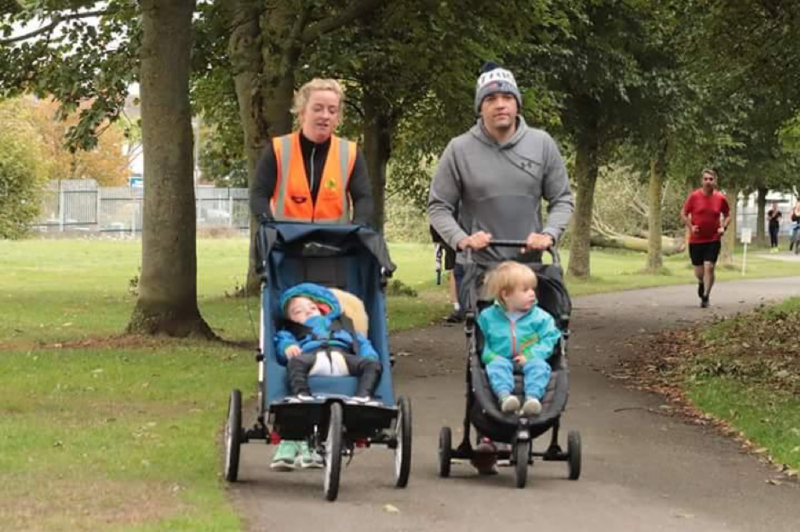 Tymon parkrun is an important part of our life now all the family help out. Daniel not only runs he volunteers as well. We marshal, tail walk and do the volunteer roundup these are things that give Daniel a quality of life. As we had a positive experience I decided that I would like to help out more families. Last September we worked with the charity Daniels Voyage to attract and support children with special needs. The route is accessible and we have disabled parking and storage. 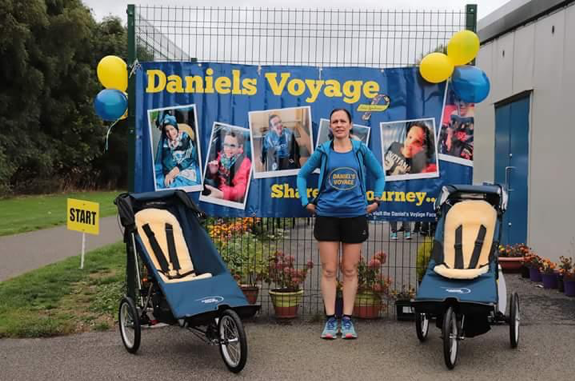 Daniels Voyage sourced two running buggies which they then loan to any parkrun family that needs them. One buggy was purchased with support from South Dublin Sports Partnership the other from charity funds. We have had great interest. 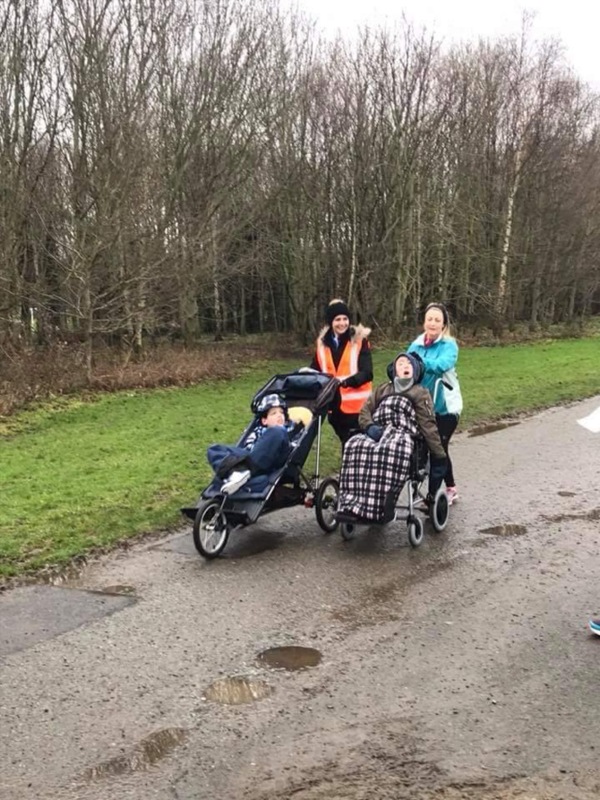 Several families have came along and tried our buggies, some even then deciding to buy their own for use at parkrun and other times. 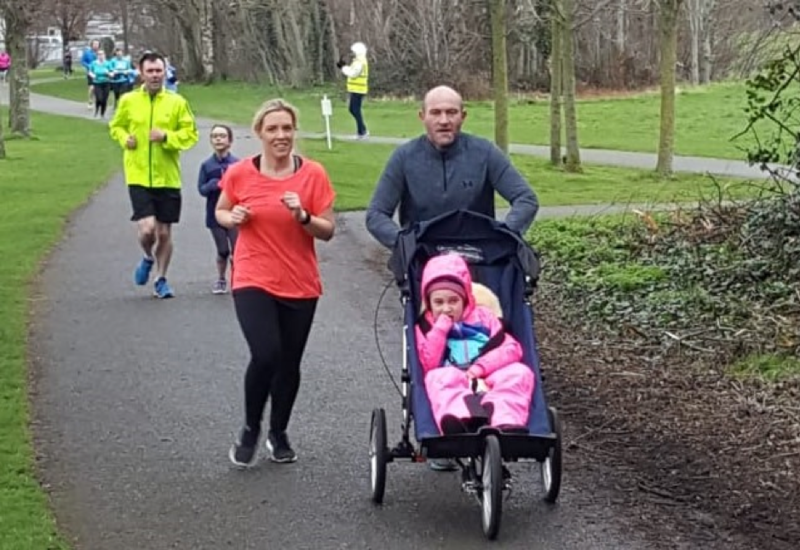 The parkrun community support has also been fantastics with the families concerned are making lots of new connections and friends. It’s great to be able to share this with other families going through similar situations. 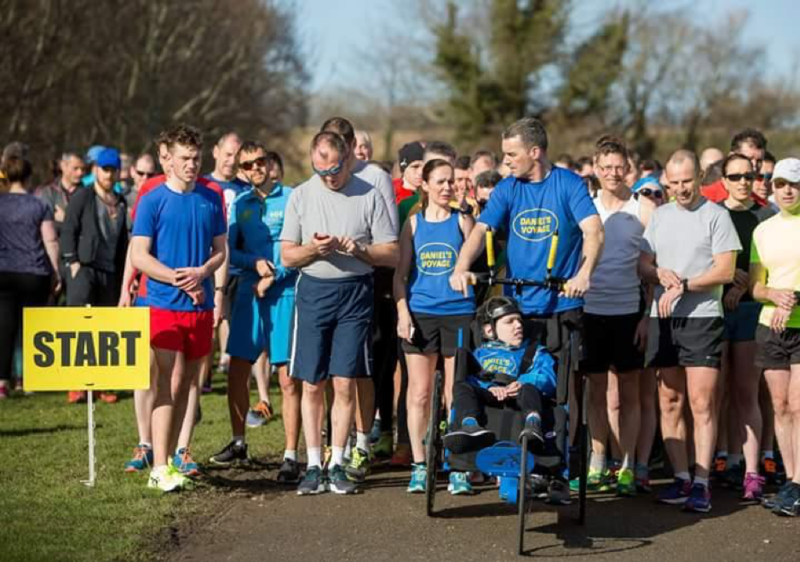 The community of parkrun really supports us and lifts us up when we are down. The most important thing it gives all with disabilities an identity a sense of purpose and a quality of life. “I can’t believe you’re doing this!” said one runner cheerfully as we overtook her on a downhill stretch of the 5k Tymon parkrun course last Saturday. This comment stuck in my mind because I’m sure there is many people who wonder why I get up at 6am on a Saturday morning, get my disabled daughter up and ready to go out. I push her wheelchair into the van, load up the jogging buggy, and drive to the other side of the city, before unloading everything, transferring her from her wheelchair into the buggy and then running 5k pushing it. Candi and Bronwyn tried out the loan buggy and have now have bought one of their own. 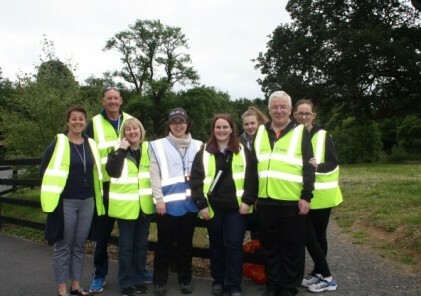 The also volunteer as well and are regulars at our parkrun. When you find out your little boy won’t be able to do all things that other children do and make the same relationships and friendships other children might, it’s hard to look to the future. You feel a sense of loss and sorrow for the life they could have lived. Then along comes the parkrun! Not only is Maximus a participant in his own right, with his own barcode and time. He is part of a small community of great people who welcome him and accept him. Maximus gets cheers and high fives the whole way around the course and he loves every minute. As a parent you can’t ask any more of a Saturday mornings. Fresh air, exercise and great fun. Keira Jane and Ian can be together as a family with their two boys Maximus and Bastain. Nicole is an 8 year old girl with a Severe Intellectual Disability and Autism. We have been struggling recently as a family due to Nicole’s limited interests and her negative behaviour becoming increasingly challenging. We felt as a family we were becoming more and more restricted to the house and were desperate for something to change. We did it and her first parkrun could not have gone better. Straight away everyone was so welcoming and to see other children in the same jogging buggies as Nicole eased our minds completely. Nicole really seemed to love her buggy, she looked so comfortable, we have never seen her so content. 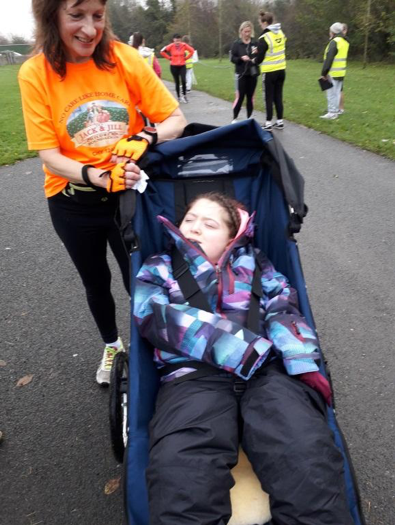 Nicole struggles with stopping and waiting but she was so happy just sitting in her buggy waiting for parkrun to start. During the run Nicole had a smile on her face for the whole time. She was relaxed, excited, happy, content and she particularly enjoyed the wind blowing against her face. Crossing the finish line was probably one of the proudest moments myself and her Dad Declan have experienced with her. parkruns not only benefit our physical and mental health but more importantly brings us so much happiness and pride that we are achieving this with Nicole. The following week Nicole’s younger brother Eoghan and cousins came out to support her, they were so excited about being able to share this with Nicole. Sophia and Emily ran with Nicole and the younger kids cheered us on. It was so touching and special. We are creating precious family memories and it’s all because of Nicole. parkruns have opened up a new chapter in our lives, they have given us a new drive and a new goal. Nicole is part of a community now and as her parents, this gives us such an overwhelming sense of inclusion and acceptance of our daughter. I started doing parkrun myself in Tymon and this is where I met Sinead running with her son Daniel. Our son Gary will be 20 this year and has cerebral palsy and is totally wheelchair bound. I never would have considered a parkrun with him before this, but he really enjoys them! Everyone is so welcoming and they come over to chat to him which he loves. It is fantastic to be able to do this together with him as we are very limited to what activities we can do together. We have purchased one of the jogger chairs after trying out the loan one. We hope to do many more parkruns together.